Symbolic of Mum's unconditional love for her family, she'll adore this beautiful open heart pendant created especially for her. Available in your choice of sterling silver, 10K yellow or white gold, this Mother's pendant may be personalised with six 2mm imitation birthstones which represent each family member (see other products in this category for identical pendants holding less than six birthstones). The advertised price is for a sterling silver pendant without a chain. Please select from the drop-down menus below if you wish to order your pendant in gold and / or purchase a chain. 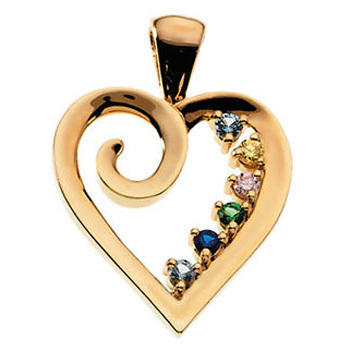 NB: Please allow 4 - 6 weeks to receive your personalised Heart Birthstone Pendant.